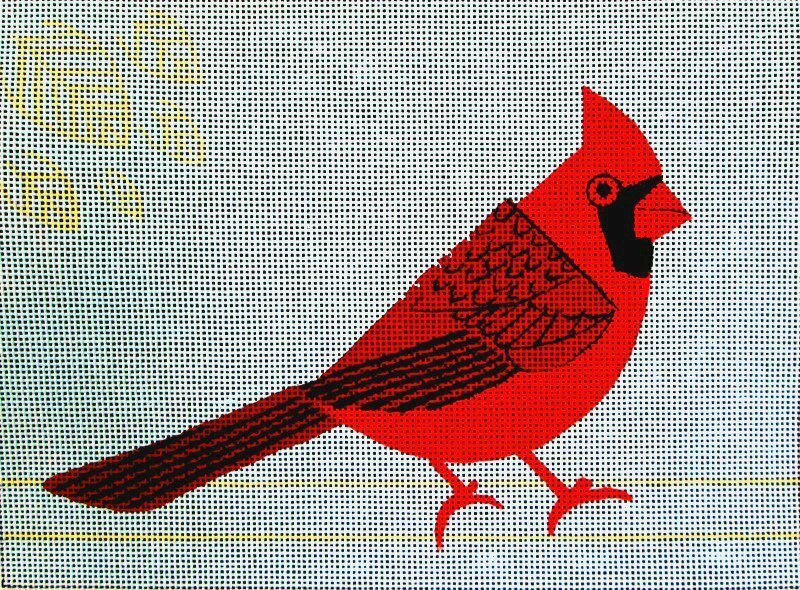 Needlepoint is easiest when you are stitching straight lines. But sometimes it throws you a curve. 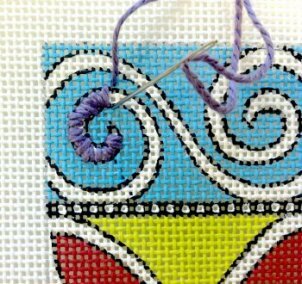 Here are four great ways to stitch a needlepoint curve. Use a tent stitch to follow the curved line as closely as you can, in a step-wise or zig-zag fashion. 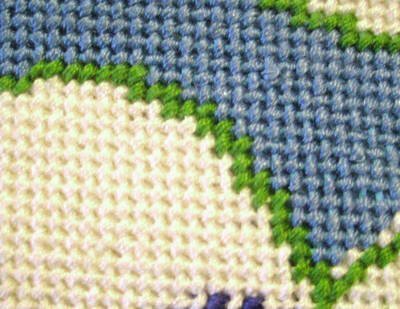 This is the most common way of stitching a curve, or diagonal line, in needlepoint. The zig-zag approach creates a strong line, but it is not a very smooth curve, as the stitches are laid down in steps. However, when the design is completed and you are not looking at each individual element, but are taking in the design as a whole, you will not notice that these curves are created in a step-wise fashion. 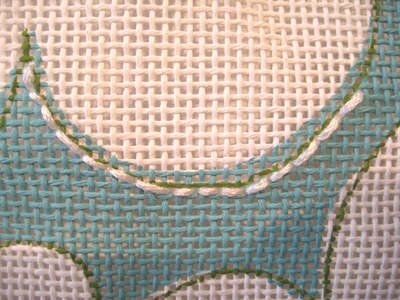 Using a back stitch is a great way to stitch a needlepoint curve. 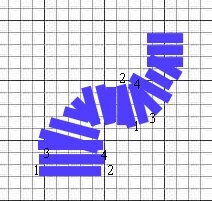 Use a long stitch over two or more stitch intersections to follow the arc of the curve. You can see in this photo (where we have stitched white thread on a green curve so you can see the stitches), that we have used stitches of different lengths and directions to hug the curve. 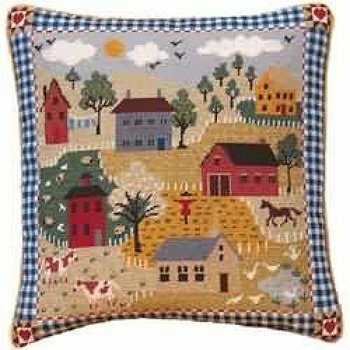 You can find directions on our website for how to do a needlepoint back stitch. 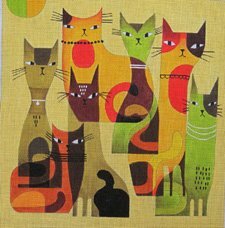 It can be done as surface embroidery (stitched on in a finer thread after the canvas is completed), or you can do what I have done here and stitch it directly onto the canvas. See how much smoother the arc of the curve is when you stitch a needlepoint curve using a back stitch? 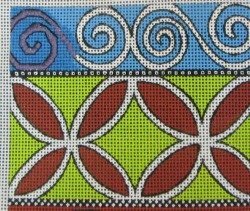 If you decide to use a Back Stitch to stitch a needlepoint curve, you can get a thicker, smoother, more defined line by wrapping the stitches. This is called a Wrapped Back Stitch. It's easy: When you have placed the last Back Stitch on the curve, go back and wrap the thread around each stitch. To do this, bring the needle up at the start of the last back stitch you placed, and then slide the needle under this last stitch, working from the outside of the curve toward the inside. 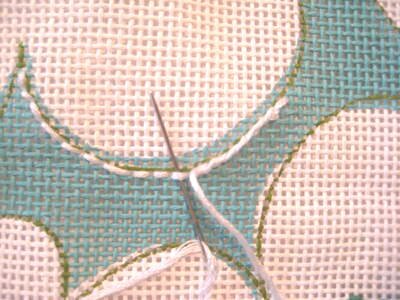 The needle stays on top of the canvas and just slides under the stitches. You can see in this photo how the needle slides under the stitch. Wrapping the back stitch forms a thick, ridged curve, and it gives the curve a nice curvy shape! You can imagine that, when all the other tent stitches come in around it, this curve will stand out nicely. 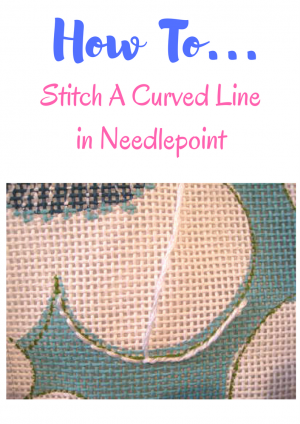 Using a Wrapped Back Stitch is a very effective and easy way to stitch a needlepoint curve. The Spiral Satin Stitch is a very handy stitch to have in your repertoire because it creates nice flowing curves in any direction and eliminates the stepped look of basketweave when curving to the left. How to Create a Spiral Satin Stitch. It’s easy! The only thing to remember is that some of the holes will be shared with more than one stitch and you want to make these holes on the tighter or inner side of the curve. So, always bring your needle down toward the tighter/inner arcs of the curve where the holes might be shared. See in this photo all the even numbers of this stitch, where the needle is brought up from behind, occur in the inner curve. The stitches don’t need to all be the same length as you curve around. Where to Use a Satin Spiral Stitch. Anywhere you have a thick(ish) curved pattern like you see with this design. Also, flower stems, tree trunks. The white curves are stitched in a mauve color so you can see it. 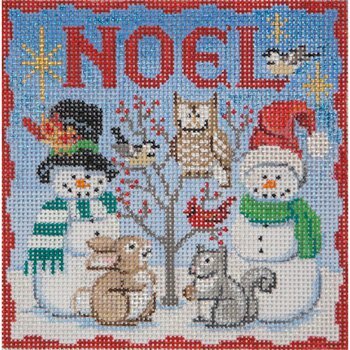 We have then stitched around the Spiral Satin Stitch in basketweave and added a Back Stitch surface embroidery using a single strand of embroidery floss. Find the South Pacific canvas here. Contact us with questions about how to stitch a needlepoint curve.